Why did people vote the way they did, what were they voting for, and will they still feel the same way when the time comes to leave the EU? 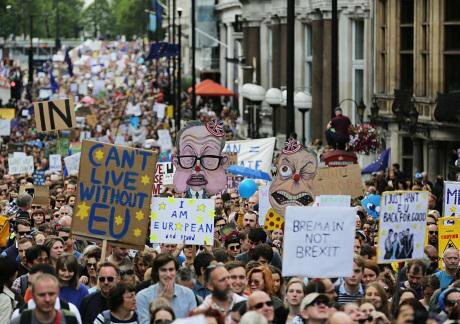 Remain supporters march through London. 2 July 2016. PAimages/Daniel Leal-Olivas. All rights reserved.In the wake of Britain’s vote to leave the EU commentators have been falling over themselves trying to explain the result of the referendum. British voters have just done something that, according to the vast majority of expert opinion, will make them considerably, and permanently, poorer and less influential. There is as much disagreement as to why people voted the way they did as there is about what should now be done about it. Many theories have been advanced over the past three weeks to explain the outcome of the referendum. For some it was the inevitable result of the political establishment reaping the rewards of a long history of EU-bashing and scapegoating. For others the public did not so much endorse the views of the political establishment, as express their disdain for it, through a protest vote aimed at out of touch elites, predominantly from those who feel left behind by globalization. Maybe though, it had nothing to do with globalization, but rather reflected a disconnect of values, between those naturally inclined to openness and tolerance and those with a more conservative and authoritarian outlook on life? Did nostalgia for the past trump common sense? Or was it simply, as some have claimed, nothing more than an act of ignorance by a particularly uninformed public? Perhaps the longer-term underlying dynamics are less central to explaining the result than the conduct of the campaign itself in the run-up to the vote. Could it be that it was the enthusiastically-employed political weight of Boris Johnson, or the noticeable lack of it from Jeremy Corbyn, that carried the day? Or that the Leave campaign was simply more skillful at exploiting emotions and more able to connect with voters? Did that side engage in a deliberate campaign of misinformation, which the media either supported or failed to challenge? Or are we simply now living in what has been termed a ‘post truth’ world in which facts, accuracy and expertise matter less than they once did? In all likelihood all of these explanations are likely to have played a significant role in the outcome of the vote. Indeed, given the closeness of the result it is likely that it was made possible only by some combination of almost all these factors. As usual, voters were driven by a mix of principles, pragmatism and a desire to protest; but while it may be (somewhat) clear what the 52% of Leave voters were against, it is not at all clear what it is they were for. Given that so many divergent explanations underlie the outcome, and that no single clear vision of a post-EU Britain was ever agreed upon during the campaign, it is fair to ask what kind of mandate the result now gives the government. The answer is a weak one. While a majority may have supported leaving the EU, beyond that there is remarkably little consensus. For instance, it would only take 5% of Leave voters to support staying in the single market, something which they were told repeatedly during the campaign would be possible, for there to be no mandate for a negotiation that results in any different outcome (assuming of course that all Remain voters would similarly prefer to stay in). Polls seem indeed to suggest a majority of the public favours remaining in the single market. Further, a non-legally binding referendum is essentially equivalent in form to a national opinion poll; albeit one with massive political weight behind it. The drawback to this is that, as the polls leading up to the referendum demonstrate, opinions can and do change on a daily basis. Already, the day after the referendum saw the widespread use of the word ‘Bregret’ to describe those who regretted their choice, or who had voted out of protest without expecting to win. Though the extent of this phenomenon should perhaps not be exaggerated it would not actually need to be very extensive in order to be decisive: Only around 2% of all voters would need to switch from Leave to Remain for a majority to lie on the other side. Presumably, if economic predictions are to be believed, then many of those who voted out of pragmatism, trusting in the assurances of the Leave side that Brexit would bring new economic opportunities, may have further reason to question their decision in the near future. However, perhaps more fundamentally, the demographics of the vote provide another reason to proceed with caution. As has been widely reported, while about 60% of those over 65 voted to Leave, around three quarters of those under 25 voted to Remain (while half of all young people were reportedly close to tears on learning the result). Though prohibited from voting, 16-18 year olds favoured remaining even more strongly. Thus, with every year that passes, as more young people reach the age of maturity and more old people pass on, the balance of opinion is likely to shift ever more in favour of remaining in the EU. It seems likely that the process of untangling the UK from the EU will take far longer than the two year period foreseen in the Lisbon Treaty’s article 50. So, even if not a single voter changes their mind about their choice, the simple passage of time means that, when the moment comes for the UK to finally leave the EU, there is a very high likelihood that it will happen contrary to the wishes of, not only a majority of the British parliament, but a majority of eligible British voters as well. All of which speaks strongly to the case for holding a second referendum when it is finally clear what are the options that are actually on the table.